What is the Mantra Project by Joanie Schwarz? I love trying to figure out what my place is in the world. As as a human being and as an artist. During the year leading up to turning 50, I studied Brene Brown's work on vulnerability. I read her books and took classes. Within the first few lessons of one of the courses I realized that vulnerability and courage are a huge part of my creative process. Empathy and connection are as well. My creativity is born out of those qualities and as uncomfortable as they are sometimes, it is what puts people at ease with me. In the York Street photograph series within the Mantra Project, I explore connection between single mothers and their children. This series grew out of a partnership between the Visual Arts Center of New Jersey, a nonprofit arts education center in Summit with programming to connect people and art, and The York Street Project in Jersey City. The York Street Project is a ministry of the Sisters of St. Joseph of Peace, which aims to reduce the cycle of poverty in households headed by women through education, housing, and childcare services. In the York Street photographs, each mantra that I painted in white on the skin of the child and/or mother is an agreement between parent and child, a kind of mission statement to help maintain strong positive family connections in spite of life’s challenges. In the entire Mantra Project, I seek to share the experience of feeling vulnerable, and the connectedness that comes from vulnerability, through both mantras and photography. I developed the concept for the project after creating my own personal mantra, “breathe into the uncertainty,” as part of a vulnerability workshop grounded in the research and teachings of Brené Brown. 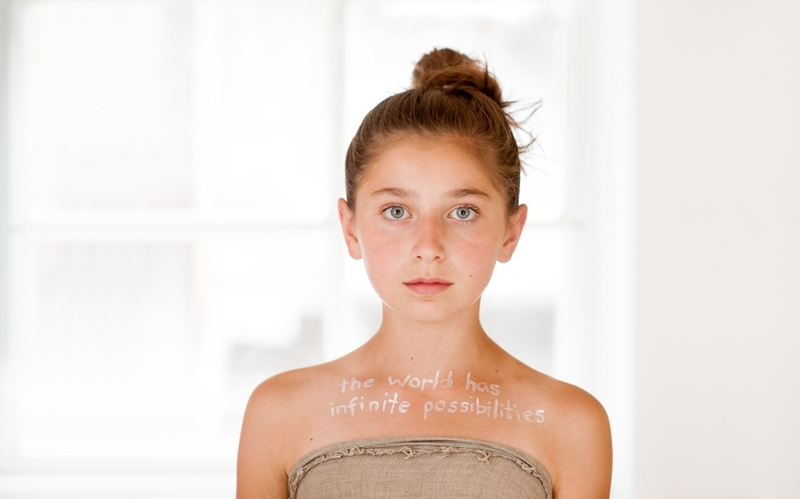 According to Brown, “vulnerability is the birthplace of connection and the path to the feeling of worthiness.” Portraits within the larger Mantra Project are of adults, teenagers, and children as young as six, painted with the words they will repeat to themselves for inner strength when the world is unkind. Human connection has been the common theme throughout all of my drawings, paintings, and photographs since I left the commercial art world in 2009. After twenty-five years creating dreamlike photographs of models or objects for hundreds of book covers, I shifted my focus to fine art portrait photography in order to explore and encourage connection and understanding between individuals and across communities. Through these intimate portraits of women and children from the York Street Project, I hope to connect the communities in which we live.